A while back, I gave a webinar about designing SharePoint information architectures, and I was surprised that there were many people unaware about how the enterprise keywords column works in SharePoint 2010 and 2013. Many people are aware that the managed metadata service application brings system-wide and user-defined tagging (“folksonomy”), but many are confused on how this actually works. 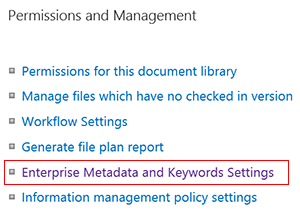 When Microsoft uses the designation of “managed metadata” it means two things: (1) enterprise metadata is managed centrally, and (2) enterprise metadata is normalized and defined. For the purposes of user-defined tagging, what we’re going to discuss fits in the former definition. The “term store” is also the designation used to define where this metadata is managed inside of the service application, and it has two parts. Using a formal term set in a column. Before we talk more specifically about the enterprise keywords column, it’s important to note there is a variant in a term set definition where you can allow the ability for end users to add tags to an existing term set. While it might at first seem to duplicate the functionality of the enterprise keywords column it is actually a different approach. If your organizations governance has decided to allow the addition of terms by an end user to a term set it can be turned on by an option in the term store management (it is an option provided when highlighting a term set in the first screenshot below) as well as when you create the column (second screenshot below). The term set submission policy. Turning on fill in terms on open term sets. The user is then afforded the opportunity to add terms to a term set in the metadata dialogue. However, even though this functionality is available, I would advise instead that you keep the term store closed and provided contact information for someone to suggest a term addition. If your organization goes through the steps to define normalized metadata then it could potentially prove to be an administrative headache to continually normalize your term set, and it decreases the value of having a true managed taxonomy. Instead, I would suggest turning to the enterprise keywords column to fill this need (and we will also talk later about how using this column still allows users to grow your taxonomy). As a final note in this section, if you’ve seen the “keywords” column in SharePoint 2007 and wondered about its purpose in 2010 and 2013, Mirjam van Olst has written an article explaining the reasoning behind its inclusion in 2010 as well how it functionally operates. Notice her remarks on how values are synced between the two, which I assume to be the same behavior in 2013. Inside the SharePoint site columns listing provided on every new site collection is a site columns group with a single column inside. 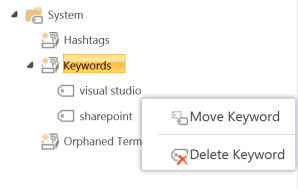 This column will be the only way to add user-defined keywords to content in SharePoint that are not bound to a term set. The enterprise keywords column in site settings. The experience is slightly different than the term store. With the enterprise keywords column there is no icon on the right to select tags since it is not bound to a term set. Instead, there is a description that talks about the nature of the column. These “tags” (which at the end of the day are really user-defined terms) can be added freely and separate by a semicolon. The default functionality of the enterprise keywords column. The enterprise keywords column recognize formal a formal term. The only aberration to this case is when you create a managed metadata column and instead of choosing a term set you choose the option to customize a term set in that interface. There is a warning given that terms added to this ad-hoc term set will not provide autocomplete values in the enterprise keywords column. A warning when you choose to create a custom term set outside of the MMS interface. There are two major ways to add the functionality mentioned above to your SharePoint content management experience. The first is to add the enterprise keywords column to a content type. You could choose to either add the functionality to one, many or all of your custom content types. The column needs no configuration; simply add it to your content type as you would any other column. I would suggest that if an organizational requirement is to add this functionality is present on any content type that you create base content types that inherit from the out-of-the-box content types (document, item, page, etc. ), and add custom content types that inherit from your base content type (I would suggest you do this anyway in any SharePoint implementation with custom content types). 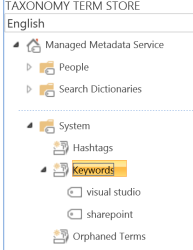 The second way to add the enterprise keywords functionality is to do so with an option present on SharePoint lists and libraries. The link in list settings to turn on enterprise keywords. The checkboxes to turn it on. You might be asking: Which method should I choose? As always, the answer depends on your organization and information management needs. If you want the functionality system wide then I would use my suggestion earlier, and add it to base content types. However, if the need is only in specific lists and/or libraries then use the setting option. Regardless of which option you choose is it important to remember that the social integration only happens with the list or library setting. Enterprise keywords submissions viewed in the MMS administration. Once the tag has made its way into the keywords section of the term store it can be moved into a term set. This is valuable, because allowing users to qualitatively describe content through tagging helps to identify where your corporate taxonomy needs to grow. Once you move it into a term set as shown below you can run all the managed metadata actions and provide synonyms and other functionality. It’s a great way to define a taxonomy both from the top-down and bottom-up. Admins can move keywords to adjust their formal taxonomies. After it has been moved you will see a different icon next to the term although it still exists in the Keywords term set. Also important to note that you cannot do any of the cool additions to 2013 terms such as custom properties until it is moved out of the Keywords term set into a formal, managed one. The enterprise keywords column is a fantastic addition to the offering provided in SharePoint 2010 and 2013. It’s an important consideration when planning your 2010 implementation, and I would highly suggest you use the enterprise keywords functionality to improve the robustness of your corporate taxonomy. Your investment in SharePoint will be maximized, and you’ll empower users to contribute to its growth and success. Nice post, Chris. I think more could benefit from your nicely laid out explanation of benefits and approach to enterprise keywords. The only way to do it that I know of is to delete and recreate the managed metadata service application, but that is presuming that you have an on-premises deployment.